Along the Central Coast of California rests a blossoming and bountiful town in San Luis Obispo. 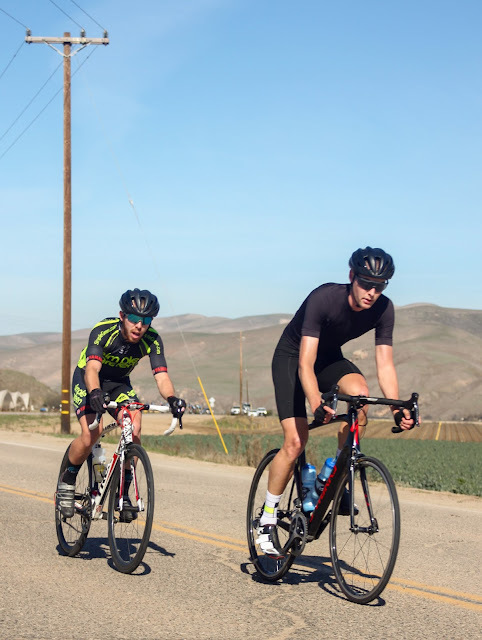 While it may be known for its outstanding location that places Santa Barbara, Los Angeles, and San Francisco within reach, its promising growth and technological innovation, or its university campus, San Luis Obispo should also be known for its cycling prominence. In California, through various online postings, cycling communities are growing in appeal. Known as tribes and villages, it is always a pleasure to have friends that pedal, push, and play. In San Luis Obispo, the community is strong, strong in spirit and physical nature, which was apparent at the Santa Barbara County Road Race on Saturday, January 27. Yes, tribes and villages are dialed; however, among college-influenced groups, which float along Highway 1, dance through the grapevines of wine country, and rally up dirt climbs on 25 millimeter tires, we prefer Orica Pistons, Tenderness Boys, or other nicknames inspired by oxygen deprivation and legs lighter than feathers. During the winter months, it was common to ride Highway 1, all while speaking in Australian accents and spewing fun facts, prior to cutting inland and staring at rear hubs as we hunkered down. (Colin Patterson always managed to deliver the hurt.) Yes, we were training; however, we were also collecting sunshine, motivating one another, expressing ourselves, and taking pedal strokes off to enjoy our laughter, before gathering ourselves and getting back to the task at hand. It's all part of a balancing act. We want to be like Orica-GreenEDGE (now Michelton-SCOTT GreenEDGE Cycling) and laugh until our jaws ache; however, we also want to resemble the Detroit Pistons from the 1980s, the "Bad Boys." We're going to have fun while jamming, but we're not going to take it from anyone. While nicknames and phrases began to pop, it was merely talk. 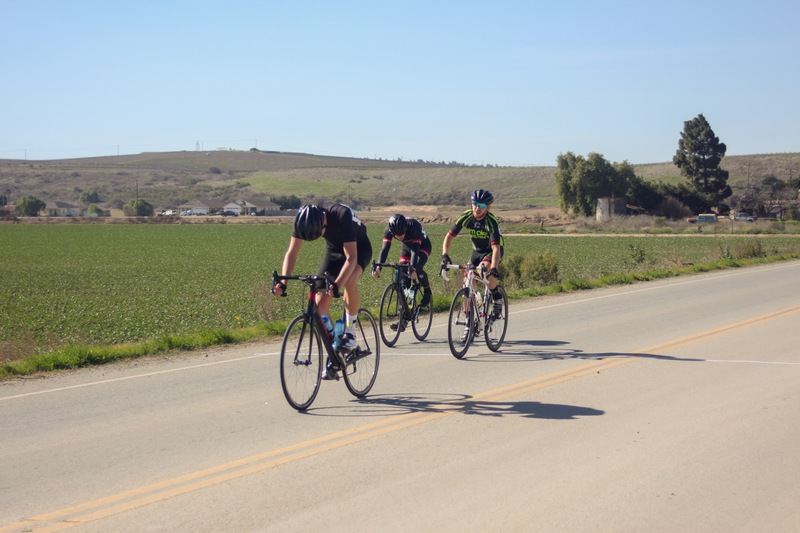 Sure, it was a solid winter, but the San Luis Obispo cycling community, as well as countless other cyclists, entered Santa Barbara County Road Race with unsure feelings. As a few friends and I lined up for the Category 3 road race, I leaned over to my close buddy, Brad Wiggs, and mentioned that this is when we begin to release sunshine. Looking back on it, I have no clue what I was saying, although it served as a reminder of the work that we had put in during the winter. We were ready. With the race unfolding slowly, we tried to remain patient, until that wasn't going to work anymore. Nearly three laps in, this four-lap race was going to finish rapidly. On a soft roller, I launched into a brisk headwind in pursuit of two leaders. Instantly, I began to think, until I couldn't think anymore. It was time to commit. After turning out of the wind, I peered back and noticed a lone figure emerging from the pack, one Brad Wiggs, a fellow Orica Piston. This was going to be hype, and it was going to hurt. With Brad and I in pursuit of two leaders, we crossed the start/finish area to complete an additional 14-mile loop. As we headed out for our final lap, I noticed a figure smiling, shaking his head, and smiling. It was Blake Anton, a professional cyclist that resides on the outskirts of San Luis Obispo. Blake mentors Cal Poly Cycling, while being a generous giver of advice, effort, and time. During racing moments, it means the world, fuels the fire, and amplifies the confidence meter, while thinking back to dishing out gut punches on local hills, over and over and over again. That smile served as inspiration. He knew that Brad and I had launched a gutsy move. This was going to take plenty of perseverance. There we were, two dudes (Brad and Sean) headed out for a fourth and final lap. Photo: Adam O'Camb. Now that lap four was underway, Brad and I had established ourselves between the leaders and a chasing peloton. With time splits coming from an official, we hopped in our foxholes and hunkered down (sound advice from Yuri Hauswald), setting our sights on the race lead. At times, I questioned what we were doing. However, Brad assured me that we needed to commit. So, we remained confident and jammed. This was going to be our race. Halfway through the final lap, Brad and I finally bridged to the leaders. A hefty chase burned plenty of matches and left a serious dent. Unfortunately, we were not going to receive any pity. Instantly, we were being asked to pull through. While a few expletives may have been taken by the Santa Maria winds, our four-man break began to cooperate and tap away at a solid rhythm. This was going to be our race. After trudging through that same headwind section, turning out of the wind, and peering toward a rapidly approaching finishing stretch, the legs began to soften, my mind went blank, and emotions began to sizzle. "GOOOOO" was all I could muster, as our break began to quiet. I could not believe our current situation. Since being off the front, I looked back for the first time. While a peloton could be seen in the distance, I remained calm and focused on my breathing. Brad and I briefly exchanged words, something about focusing and riding our race. Quite extravagant thoughts, eh? As our fluid rotation began to collapse, I couldn't sit on the front any longer. I swung out and became stubborn. With just hundreds of meters to go, it was time to fight. I was fighting for my wingman's wheel, thinking of the "Bad Boys," and not taking it from anyone. Instead of settling on fourth wheel, I gained third wheel, behind Brad. As the two of us sat on the race leader, the finishing stretch began to straighten and open. My legs lost feeling, and I began to think about how this finishing stretch could have used a bit more morning reconnaissance, but it was time to remain patient, have faith, and commit. Soon, my mind went blank and instincts took over. Constantly, I scanned the open road, before tunnel vision set in on the finishing tent. It was time to turn and burn. From second position, Brad opened up a fierce kick, which I followed, prior to popping toward the centerline. With a few kicks, I was out in the open air. We were turning and burning alright, which left me satisfied to finally cross the finishing stripe. "Sean Bird!" yelled Brad. Boom, boom. Photo: Colin Patterson. Two dudes, two dudes from San Luis Obispo, who make jokes about Orica Pistons, speak in Australian accents, and dance to DJ Cotty to warm up, just bagged positions one and two in a hot and heavy race. That's a yip, yap, yew moment. Within seconds, we were slapping hands, hugging, and speaking with other members of the San Luis Obispo cycling community that had descended on the road race. Whether you want to call it a tribe, a village, the Tenderness Boys, or the Orica Pistons, I do know that we're a family. When one wins, we all win. Day in and day out, we commit to each other in training and spirit. Our success is because of each other, and I'm stoked to be a minuscule sliver of the San Luis Obispo cycling community. Although the Santa Barbara County Road Race is in the rearview mirror, the season is just beginning, and we have a long way to go. With that, this is raw stroytelling, and I plan to leave it as such, with minimal editing. Thank you for reading, thank you for being a piece of this family, thank you for supporting Everjourney.